Reported on Irish eBay, a flag designed for the International Eucharistic Congress at Dublin (IE), 1932. This Congress must have been quite an event. Held 22-26 June 1932, it commemorated St Patrick’s arrival in Ireland 1500 years earlier. More on this topic: http://en.wikipedia.org/wiki/International_Eucharistic_Congress, http://multitext.ucc.ie/d/The_31st_International_Eucharistic_Congress_Dublin_1932 and http://multitext.ucc.ie/viewgallery/1208. The official congress symbol can be seen at http://multitext.ucc.ie/d/Official_Crest_of_the_31st_International_Eucharistic_Congress_1932. See flag as shown on eBay is a blue flag bearing the above-mentioned design – the basic one, at least - in yellow. Source: Irish eBay offer no. 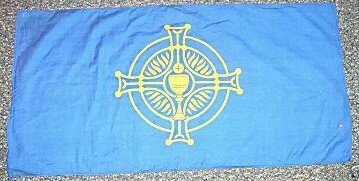 160044776907 (ended 1 Nov 2006) with comments: "This flag is one that was carried to the various cer[e]monies that took place during the Eucharistic Congress in Dublin. It is a deeper blue than it appears to be in the photo. It is in good condition. It measures 36'' X 18''."